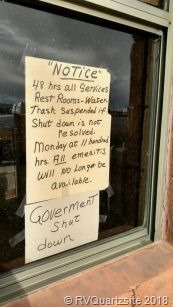 The BLM Yuma Field Office has been notified about the government shutdown and has now closed the water and septic dump station in La Posa South. Campers will be allowed to stay on the LTVAs, but no further permits will be issued at this time. Registration shacks are closed and volunteers are not officially on duty. Signs have been posted. 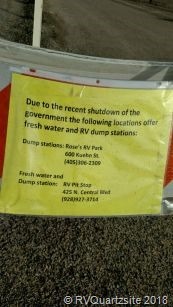 Dump and water services are available in Quartzsite. Pease see our directory at http://rvquartzsite.com/directory/categories . We know this is a terrible time for this to happen with the annual RV show and Big Tent just kicking off but please be respectful of any BLM staff you see as they are not responsible for this. Call your Congresspersons if you wish and try to relax and continue to enjoy the pleasures of Quartzsite camping. Please please also respect the desert environment and don’t dump on it.